John Brown, a visionary who can hear and see the future, past, and present, condemns the slavery of Africans. He hears voices from the future praising him in song. Act 2, scene 1: Maryland farm across the river from Harper’s Ferry, October 15–16, 1859 John Brown asserts that God will forgive blood shed in the fight to free Africans from slavery. He describes his vision of the coming Civil War in which thousands of Africans escape slavery, many joining the Northern armies to defeat the Southern slave system and to acquire land, but after the South’s defeat, real freedom and land are denied to Africans. Musical Interlude: Expressing armory raid, gun battles, killings of some of John Brown’s compatriots and others, and arrest of John Brown and some of his compatriots. 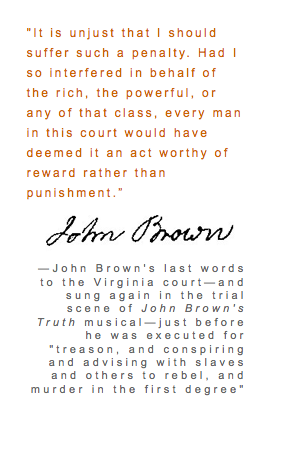 The jury declares John Brown guilty of treason, conspiracy, and murder for trying to free enslaved Africans. John Brown tells the Court his plan was to enable a “larger scale” exodus of Africans from the South to Canada, not to foment violent rebellion or insurrection. He quotes the Bible to defend the morality of his actions.